These reliable and efficient bollard LED lights service the needs of most parks and mariners. Perfect for additional site lighting, walkways, amenity block markers, pools and landscape lighting. 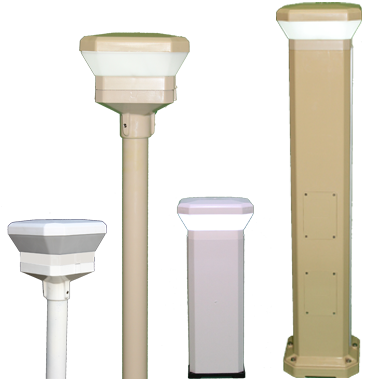 Available in pole mount and pedestal type configurations in a variety of sizes. The pillar version can have outdoor power points fitted as an option. Outdoor power point for pedestal versions. Impact and UV resistant PVC body with a 20 year guarantee. Sturdy powder coated cast alloy base for easy attachment to your pole or ours. LED input: 240v ~ 50 Hz, total power 12 watts, 6000K daylight, LED constant current driver.